Project Description: A planning project to identify ways to create and maintain sustainable environmental conditions in Wilderstein, a historic house museum with collections of fine and decorative arts, manuscript materials, books, photographs, maps, deeds, sheet music, and architectural and landscape drawings that were acquired and preserved by four generations of the Suckley family who lived in the house from 1852 to 1991. Project Description: Planning for sustainable environmental conditions to preserve humanities collections in Dumbarton House, a Federal period historic house museum with holdings of furniture, fine and decorative arts, household goods, clothing and textiles, as well as books, manuscripts, and maps that document the history of Georgetown and Washington, D.C., in the early 1800s. Project Description: A planning project to determine storage solutions for 2,600 artifacts and 1,300 publications, archival records, photographs, and oral history recordings of prison life dating from the late 18th to mid-20th centuries. Project Description: Implementation of a new 14,500-square-foot permanent exhibition on the history of African American efforts to gain freedom and equality and the interpretation of the Lorraine Motel historic site at the National Civil Rights Museum. Congratulations to everyone on their grants! If you applied and weren’t funded, be sure to request the comments from the review panel. They’ll be helpful not only if you plan to apply again (rumor has it you have to apply 2-3 times before you’re funded) but even if you don’t, you get free advice from your peers about your project. 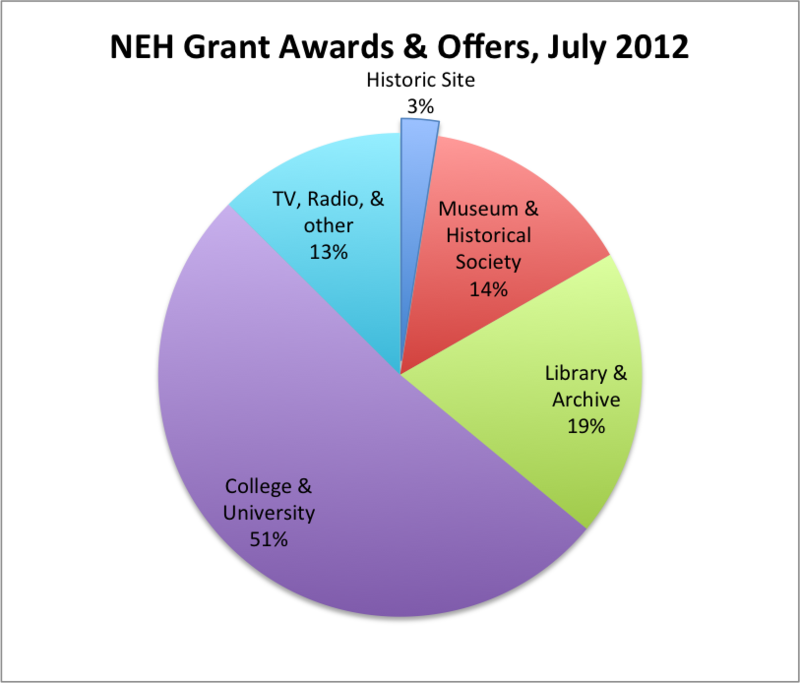 Grants Awards, July 2012, National Endowment for the Humanities. If you are really interested in federal support for historic sites, house museums, or even museums in general, don’t scan the entire 46 page list of awards. I found it rather disheartening. Fifty-one percent of the grants (and largest ones, as well) were given to colleges and universities–how are we supposed to compete with their resources and development departments? Historic sites and house museums received only 3 percent of the grants, even though they represent the largest type of museum in the United States and have the fewest resources. The disparity really struck me when I noticed that in Washington, DC, a city packed with humanities-based institutions (e.g., museums, historic sites, libraries, and universities), only three grants were awarded–two to the Folger Shakespeare Library. Don’t misunderstand me, I love the Folger and support its mission, but really, can so few institutions in Washington, DC qualify for an NEH grant? Is it fair that a non-profit organization with $275 million in assets receive $509,056 in federal monies? It may be time that the federal funding process needs to be revised to better align with institutional needs and be more equitably distributed.